Shrimp Po-Boy from Parkway Bakery. Photo by Caitlyn Ridenour. There are po-boys, and then there is the Parkway Bakery. 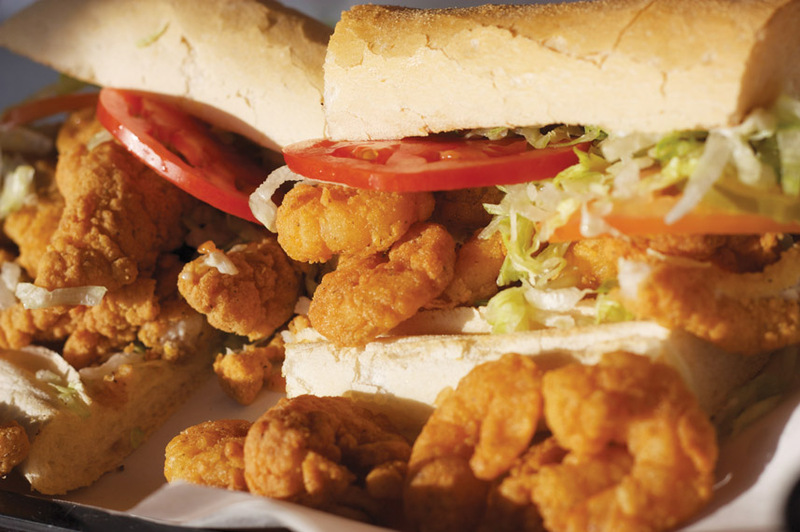 The Mid-City stalwart serves up impeccable examples of the iconic New Orleans sandwich, while always innovating and adding new po-boys to the menu. Case in point, the Surf and Turf, which pairs the debris-style roast beef with large, golden fried shrimp. The key is tearing open the white butcher paper wrapped sandwich as fast as possible before the shrimp lose their crispy coating. Or devour the beef hot sausage patty, a hamburger with a backbone of cayenne. Get it dressed. The mayo and the oil from the patty combine to create a salad dressing worthy of a bottling by Paul Newman. Another sign the kids at Parkway aren’t playing around is the french fry po-boy, whose roast beef gravy and drippings is sure to scare away any unassuming vegetarian. Prices though can be a little steep, calling into question if they can really be called a poor boy. But there is no denying the quality of ingredients and ethos behind the operation. The roast beef is cooked slowly to develop a deep flavor in the thin gravy as well as a supreme tenderness to the beef. Same goes for the corned beef, which is sliced to the thickness of a playing card and piled high on Leidenheimer just like everything else. And they have to be doing a lot right, as the place is always packed no matter when you go. But here is a tip. Instead of standing in line like everyone else, jostle for a seat at the bar, get yourself a cold beer or Barq’s in the bottle (those being the only two acceptable accompaniments) and place your po-boy order with the barkeep. Now that is living. 538 Hagan Avenue. 482-3047. 11a-10p daily. Closed Tuesday.